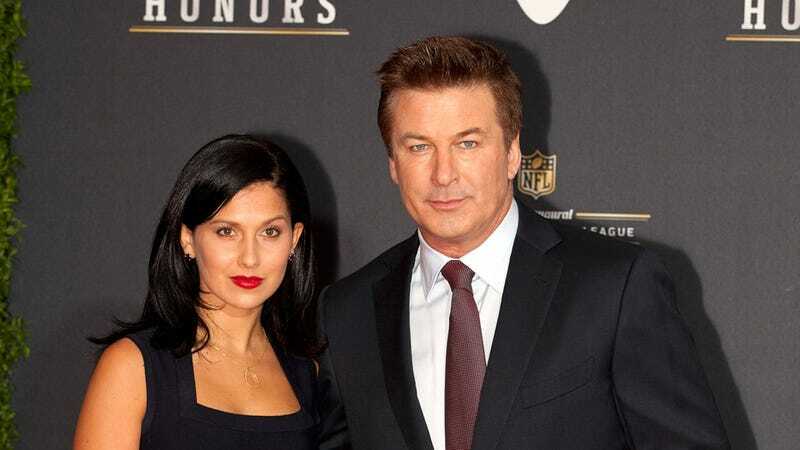 Alec Baldwin and Hilaria Thomas Are Engaged, But Will Liz Lemon Bless Their Union? Alec Baldwin, he of the perpetually icy yet surprised stare, certainly does like to keep us on our toes—and he's done it again. He's just gotten engaged to his 28-year-old girlfriend Hilaria Thomas. This has been rumored before, but this time it's for real. There's even a ring to prove it. He proposed with this giant sparkly thing while the two were on Long Island this weekend. Baldwin, 54, has been married once before. (You might remember the explosive end to his relationship with Kim Basinger.) This will be Thomas's first marriage. Baldwin has a history of being a bit, um, changeable, shall we say, but perhaps Thomas, who is a yoga instructor and therefore professionally serene, has what it takes to tame the Baldwin beast? Unbeknownst to Lambert, the source adds that Shelton does in fact have something up his sleeve for their special day. "He's planning something big for their anniversary," the source shares. "It will surely involve lots of drinking, and some more diamonds!" [It] just shattered me to hear that song played under those conditions. I thought my heart was gonna stop. It just pierced me like a knife. It's just -– I can't explain that feeling, to think that that was so final for her, and that that was my words and my feeling –- I would forever be so connected to her.